At Borges International Group we believe that healthy and sustainable growth and good reputation in the communities in which we operate depend on consistently adhering to a Code of Ethics based on respect for laws, humanity, loyalty, fairness and responsibility. These principles describe the behavior we expect from our employees and from the rest of the interest groups. Our Code of Ethics and our Criminal Compliance Policy has been formulated in order to unify and reinforce the identity, culture and behavior patterns of Borges International Group. We are convinced that a consolidated culture of shared values enhances our virtues and competences and enhance creating value for all our stakeholders. Ensure equality of treatment and opportunities between women and men in the company. Contemplate measures in the Plan aimed at reconciling work and family life. Review of harassment protocol and procedure in case of non-compliance. Revise the practical manual on non-sexist language. A social benefits programme guaranteeing quality and stability of the employment and favour the reconciliation of work and family life. 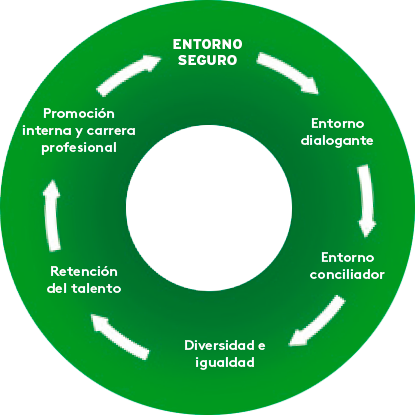 The “Borges Te Cuida” (“Borges Cares for You”) programme aims to transfer values, promote healthy habits and generate commitment to be a Sustainable, Healthy and Supportive company.